I love Sundays. It did feel a bit weird being away from the “routine” of Sundays and all the responsibilities that entails for me in the States. But for our team to load up the bus, grab some kids from the neighborhood along the way and then file in to Verbo Church was a great experience for us. It was good to be the minority. Good to be the visitors. Good to be stretched beyond what most of us are used to in a worship service. It was good to have the challenge of listening and engaging when we didn’t speak the language. It was also good, for in the service this morning, we experienced a bit of heaven. One day, every tribe, tongue and nation will be gathered when God calls His children home. One day we will all join the chorus of the angels, singing, “Holy, holy, holy” in our native tongue and rather than dividing us, we will be united. Man, I long for that day. Some of the team struggled a bit today when I broke the news that we were going to have to do some construction this afternoon. It isn’t our usual Sunday pattern, and I would bet a good many are already a bit exhausted. I even wrestled if that is what God had for us and it was the right decision. I’ve learned not to just do what makes logical sense to me in the attempt to “get more done.” But God gave some rest on the ride out to Las Parcelas (I’ve never been able to understand how some of these students can sleep on a bus driving down roads that look like land mines went off). And in true God form, He wanted us to be there. Our work was hard, but not long. 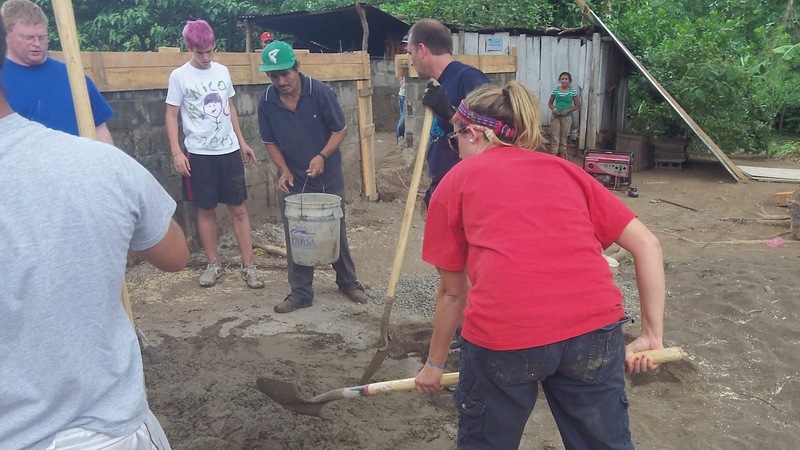 Making concrete Nica-style is hard work. No concrete truck pulling up or mixer to dump the ingredients in. The ground is our workspace and armed with shovels, we become the mixers. We made two full batches to fill the forms that Marvin (our foreman) had prepared around the vegas. We completed everything he framed out. In fact, the last bucket of concrete from the last batch was the perfect amount. I just glanced upward and said, “Thanks.” He is always right. But it was more than just getting the work done – although that was important. Mixing concrete – with 6 or so students working together – is a team-building experience. You have to learn to work together and you have to learn to hand off the shovel when you are tired. God wanted us to learn that today. And I’m quite sure He has more to teach us in that area, but I’m appreciative of the unity He has brought to this team. Another blessing today was two of our campers were there with the family and we got to just enjoy some time playing. It gave everyone a role to play. Some were chasing kids, others mixing concrete and others (ok really Dylan) were talking with the family (since he is the only one who really can speak fluently with them). I’m so grateful to God for how our day turned out. We even got back earlier than usual and He gave us the some rest and relaxation at the pool or around the compound. He knows what we need. He’s always speaking. We’re all learning a bit better how to listen to His voice and obey.